A small plane area is rotated in an electric field. In which orientation of the area, is the flux of the electric field through the area maximum? In which orientation is it zero? E→and the normal to the surface area. θ= 0, the flux is maximum, i.e. the electric field lines are perpendicular to the surface area. θ= 0 and, hence, flux is also 0. Thus, if the electric field lines are parallel to the surface area, the flux is minimum. A circular ring of radius r made of a non-conducting material is placed with its axis parallel to a uniform electric field. 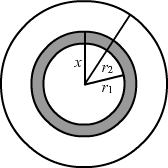 The ring is rotated about a diameter through 180°. Does the flux of the electric field change? If yes, does it decrease or increase? A charge Q is uniformly distributed on a spherical shell. What is the field at the centre of the shell? If a point charge is brought close to the shell, will the field at the centre change? Does your answer depend on whether the shell is conducting or non-conducting? The field at the centre of the shell is zero. As all the charge given to a conductor resides on the surface, the field at any point inside the conducting sphere is zero. Also, the charge distribution at the surface is uniform; so all the electric field vectors due to these charges at the centre are equal and opposite. So, they cancel each other, resulting in a zero net value of the field. When a charge is brought near the shell, due to induction, opposite polarity charges induce on the surface nearer to the charge and the same polarity charges appear on the face farther from the charge. In this way, a field is generated inside the shell. Hence, the field at the centre is non-zero. Yes, our answer changes in case of a non-conducting spherical shell. As the charge given to the surface of a non-conducting spherical shell spreads non-uniformly, there is a net electric field at the centre of the sphere. A spherical shell made of plastic, contains a charge Q distributed uniformly over its surface. What is the electric field inside the shell? If the shell is hammered to deshape it, without altering the charge, will the field inside be changed? What happens if the shell is made of a metal? As the shell is made of plastic, it is non-conducting. But as the charge is distributed uniformly over the surface of the shell, the sum of all the electric field vectors at the centre due to this kind of distribution is zero. But when the plastic shell is deformed, the distribution of charge on it becomes non-uniform. In other words, the sum of all the electric field vectors is non-zero now or the electric field exists at the centre now. In case of a deformed conductor, the field inside is always zero. A point charge q is placed in a cavity in a metal block. If a charge Q is brought outside the metal, will the charge q feel an electric fore? Yes, the charge Q will feel an electric force, as the charge q given to the metal block appears on the surface. Hence, it exerts an electric force on the charge Q. A rubber balloon is given a charge Q distributed uniformly over its surface. Is the field inside the balloon zero everywhere if the balloon does not have a spherical surface? No, the field is not zero everywhere, as the electric field vector due to the charge distribution does not cancel out at any place inside the balloon because of its non-spherical shape. It is said that any charge given to a conductor comes to its surface. Should all the protons come to the surface? Should all the electrons come to the surface? Should all the free electrons come to the surface? Protons never take part in any electrical phenomena because they are inside the nuclei and are not able to interact easily. These are the free electrons that are responsible for all electrical phenomena. So, if a conductor is given a negative charge, the free electrons come to the surface of the conductor. If the conductor is given a positive charge, electrons move away from the surface and leave a positive charge on the surface of the conductor. The electric field remains same for the plastic plate and the copper plate, as both are considered to be infinite plane sheets. So, it does not matter whether the plate is conducting or non-conducting. The particle is a conductor. When it is brought near a positively charged metal plate, opposite charge is induced on its face nearer to the plate, i.e. negative and the same amount of charge, but of opposite polarity, goes to the farther end, i.e. positive. Now, the attractive force is due to charges of opposite polarity. As they are at a lesser distance than the same polarity charges, the force of attraction is greater than the force of repulsion. In other words, the force on the particle is towards the plate. A charge placed outside a conductor can induce a charge on it or can affect the charge on its surface. But it does not affect what is contained inside the conductor. Similarly, charge q1 can affect charge Q; still, the force inside the conductor remains zero. An analogy to the above statement is that when lightning strikes a car, the charge that appears on the car’s metal surface does not affect its interior. Due to this passengers are recommended to sit inside the car. This question can be answered using the concept of electric field lines. We know that electric field lines emerge from a positive charge and move towards a negative charge. Now, charge Q, on the face in front of charge q1, tries to nullify the field lines emerging from charge q1. So, the charge on the farther face of the conductor dominates and, hence, a force appears to the right of charge q. The flux through a surface does not depend on its shape and size; it only depends upon the charge enclosed inside the volume. Here, the charge enclosed by the sphere of radius 10 cm and the sphere of radius 20 cm is same so the flux through them will also be same. ν.At t = 0, the left end just touches the centre of the face of the cube opposite it. Which of the graphs shown in the figure (30-Q2b) represents the flux of the electric field through the cube as the rod goes through it? At first, when the rod is inserted into the cube, the flux start increasing. When the rod is fully inserted, the flux becomes constant and remains constant for the remaining L/2 length of the rod. After that, as the rod moves out of the cube, the flux starts decreasing. 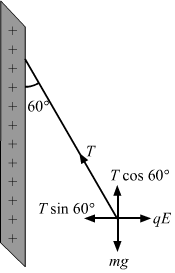 These processes are depicted only by curve (d). ∈0. But the question is about an open cylindrical vessel. Now, take another identical vessel and make a closed Gaussian surface enclosing the charge, as shown in the figure. (a) Gauss’s Law is valid only for symmetrical charge distributions. (b) Gauss’s Law is valid only for charges placed in vacuum. (c) The electric field calculated by Gauss’s Law is the field due to the charge inside the Gaussian surface. (d) The flux of the electric field through a closed surface due to all the charges is equal to the flux due to the charges enclosed by the surface. The contribution of flux on the closed surface due to the charges lying outside the surface is zero because number of field line entering the closed surface is equal to the number of field lines coming out of the surface so the net contribution of the charge lying outside the closed surface to the flux is zero. Therefore, the net flux through the surface due to the charge lying outside the the closed surface is zero. The contribution that counts is only due to the charges lying within the closed surface. Thus, the flux of the electric field through a closed surface due to all the charges (inside and outside the surface) is equal to the flux due to the charges enclosed by the surface. A positive point charge Q is brought near an isolated metal cube. (a) The cube becomes negatively charged. (b) The cube becomes positively charged. (c) The interior becomes positively charged and the surface becomes negatively charged. (d) The interior remains charge free and the surface gets non-uniform charge distribution. Since the cube is metallic, the charge gets distributed on the surface and the interior remains charge-free. However, when a positive point charge Q is brought near the metallic cube, a negative charge gets induced on the face near the positive charge Q and an equal positive charge gets induced on the face, which is away from the charge Q. Thus, the metallic surface gets non-uniform charge distribution. A large non-conducting sheet M is given a uniform charge density. Two uncharged small metal rods A and B are placed near the sheet as shown in the figure (30-Q4). Since the non-conducting sheet M is given a uniform charge, it induces a charge in the metal rod A, which further induces a charge in the metal rod B, as shown in the figure. Hence, all the options are correct. As the flux is zero through the surface, the charge enclosed must be zero. But the electric field is not necessarily zero everywhere on the surface. For example, in the case of a dipole enclosed by the surface, the electric field through the surface is not zero but has some value. So, the correct answers are (b) and (c). An electric dipole is placed at the centre of a sphere. Mark the correct options. (a) The flux of the electric field through the sphere is zero. (b) The electric field is zero at every point of the sphere. (c) The electric field is not zero anywhere on the sphere. (d) The electric field is zero on a circle on the sphere. The sphere encloses a dipole, i.e. two equal and opposite charges. In other words, net charge enclosed in the sphere is zero. Hence, the flux is zero through the sphere. θis the angle made by the point p with the centre of the dipole. Hence, we can see that the field is not zero anywhere on the sphere. Figure (30-Q5) shows a charge q placed at the centre of a hemisphere. A second charge Q is placed at one of the positions A, B, C and D. In which position(s) of this second charge, the flux of the electric field through the hemisphere remains unchanged? These are the only points in the straight line with the charge q and at the brim of the hemisphere. So, field lines emerging from these charges do not affect the flux through the hemisphere due to charge q. On the other hand, the two remaining charges are beside the surface of the hemisphere and not in line with the charge q and not at the brim. So, they will affect the flux. Hence, the correct answers are (a) and (c). Initially, there is no charge in the closed surface. As the wire is neutral, the flux initially is zero. Now, if we connect the battery and a current flows through it, the flux remains zero, as the number of electrons entering the surface is equal to number of electrons leaving. That is, net charge enclosed is zero and so is the flux. A positive charge at point P will induce a negative charge on the near face of the conducting sphere, whereas the positive charge on the farther end of the sphere. As this father end is enclosed or intersected by the closed surface, so the flux through it will become positive due to the induced positive charge. E→=35E0 i→+45 E0 j→ with E0=2·0×103 N C-1. Find the flux of this field through a rectangular surface of area 0⋅2 m2 parallel to the y–z plane. 35E0i⏜passes perpendicular to the plane; so, only this component of the field will contribute to flux. 45E0j⏜moves parallel to the surface. A charge Q is uniformly distributed over a rod of length l. Consider a hypothetical cube of edge l with the centre of the cube at one end of the rod. Find the minimum possible flux of the electric field through the entire surface of the cube. Show that there can be no net charge in a region in which the electric field is uniform at all points. It is given that the electric field is uniform. If we consider a surface perpendicular to the electric field, we find that it is an equipotential surface. Hence, if a test charge is introduced on the surface, then work done will be zero in moving the test charge on it. But if there is some net charge in this region, the test charge introduced on the surface will experience a force due to this charge. This force has a component parallel to the surface; thus, work has to be done in moving this test charge. Thus, the surface cannot be said to be equipotential. This implies that the net charge in the region with uniform electric field is zero. E0=5×103 N C-1, l=2 cmand a = 1 cm. It is observed that the flux passes mainly through the surfaces ABCD and EFGH. The surfaces AEFB and CHGD are parallel to the electric field. So, electric flux for these surfaces is zero. The electric field intensity at the surface EFGH will be zero. E→=E0 xli^At EFGH, x = 0; thus, the electric field at EFGH is zero. A charge Q is placed at the centre of a cube. Find the flux of the electric field through the six surfaces of the cube. 1∈0times the charge enclosed by that surface. where Ï• is the flux through the closed surface and q is the charge enclosed by that surface. The charge is placed at the centre of the cube and the electric field is passing through the six surfaces of the cube.vSo, we can say that the total electric flux passes equally through these six surfaces . A charge Q is placed at a distance a/2 above the centre of a horizontal, square surface of edge a as shown in the figure (30-E1). Find the flux of the electric field through the square surface. Assume that the given surface is one of the faces of the imaginary cube. Then, the charge is found to be at the centre of the cube. a2from the centre of the surface. The electric field due to this charge is passing through the six surfaces of the cube. Find the flux of the electric field through a spherical surface of radius R due to a charge of 10−7 C at the centre and another equal charge at a point 2R away from the centre (figure 30-E2). Let charge Q be placed at the centre of the sphere and Q‘ be placed at a distance 2R from the centre. According to Gauss’s Law, the net flux through the given sphere is only due to charge Q that is enclosed by it and not by the charge Q‘ that is lying outside. So, only the charge located inside the sphere will contribute to the flux passing through the sphere. A charge Q is placed at the centre of an imaginary hemispherical surface. Using symmetry arguments and Gauss’s Law, find the flux of the electric field due to this charge through the surface of the hemisphere (figure 30-E3). Let us assume that a spherical closed surface in which the charge is enclosed is Q. 2·0×10-4 C m-3. Find the electric field at a point inside the volume at a distance 4⋅0 cm from the centre. 7·0×10-10 m. Assume that the positive charge is distributed uniformly throughout the nuclear volume. Find the strength of the electric field at (a) the surface of the nucleus and (b) at the middle point of a radius. Remembering that gold is a conductor, is it justified to assume that the positive charge is uniformly distributed over the entire volume of the nucleus and does not come to the outer surface? ϕ = ∮E→.ds→=Q∈0⇒∮Eds=Q∈0The value of E is fixed for a particular radius. ⇒ E=79×1.6×10-198×4π ∈0.r2 at r = 3.5×10-10 =1.16×1021 N/C.As electric charge is given to a conductor, it gets distributed on its surface. But nucleons are bound by the strong force inside the nucleus. Thus, the nuclear charge does not come out and reside on the surface of the conductor. Thus, the charge can be assumed to be uniformly distributed in the entire volume of the nucleus. A charge Q is distributed uniformly within the material of a hollow sphere of inner and outer radii r1 and r2 (figure 30-E4). Find the electric field at a point P at a distance x away from the centre for r1 < x < r. Draw a rough graph showing the electric field as a function of x for 0 < x < 2r2 (figure 30-E4). r2Consider an imaginary sphere of radius x. ∮ E.ds=q∈0Here, the surface integral is carried out on the sphere of radius x and q is the charge enclosed by this sphere. E(4π x2) = x3-r13Qr23-r13 ∈0E = Qx3-r134π ∈0 x2 r23-r13The electric field is directly proportional to x for r1 < x < r.
A charge Q is placed at the centre of an uncharged, hollow metallic sphere of radius a. (a) Find the surface. (b) If a charge q is put on the sphere, what would be the surface charge densities on the inner and outer surfaces? (c) Find the electric field inside the sphere at a distance x from the centre in the situations (a) and (b). We know that charge given to a hollow sphere will move to its surface. Surface charge density is the charge per unit area, i.e. σin=-q4πa2As the charge has been added to the outer surface, the total charge on the outer surface will become (Q+q). To find the electric field inside the sphere at a distance x from the centre in both the situations,let us assume an imaginary sphere inside the hollow sphere at a distance x from the centre. ∮ E.ds=Q∈0E∮ ds=Q∈0E(4πx2)=Q∈0 E=Q∈0×14πx2 = Q4π ∈0 x2Here, Q is the charge enclosed by the sphere. As the point is inside the sphere, there is no effect of the charge q given to the shell. Consider the following very rough model of a beryllium atom. The nucleus has four protons and four neutrons confined to a small volume of radius 10−15 m. The two 1 s electrons make a spherical charge cloud at an average distance of 1⋅3 ×10−11 m from the nucleus, whereas the two 2 s electrons make another spherical cloud at an average distance of 5⋅2 × 10−11 m from the nucleus. Find three electric fields at (a) a point just inside the 1 s cloud and (b) a point just inside the 2 s cloud. Let us consider the three surfaces as three concentric spheres A, B and C.
2×10-6 C m-1We need to find the electric field at a distance of 4 cm away from the line charge. -2 m and height l.
Let the magnitude of the electric field at a distance of 4 cm away from the line charge be E.
ϕ=∮E→.ds→There will be no flux through the circular bases of the cylinder; there will be flux only from the curved surface. The electric field lines are directed radially outward, from the line charge to the cylinder. Therefore, the lines will be perpendicular to the curved surface. 2·0×10-8 C m-1. An electron revolves around it in a circular path under the influence of the attractive electrostatic force. Find the kinetic energy of the electron. Note that it is independent of the radius. ρ. Find the electric field at a point P inside the cylindrical volume at a distance x from its axis (figure 30-E5). 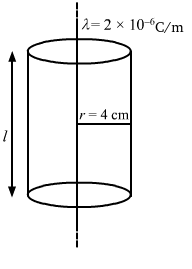 ρLet the radius of the cylinder be r.
Consider a Gaussian cylindrical surface of radius x and height h.
ρ. Find the electric field at a point P inside the plate, at a distance x from the central plane. Draw a qualitative graph of E against x for 0 < x < d.
Let the surface area of the sheet be s.
Consider an imaginary plane at a distance x from the central plane of surface area s.
4·0×10-6 C m-2. Find the force of attraction between the particle and the plate. 4·0×10-6 C. In equilibrium, the thread makes an angle of 60° with the vertical. Find the surface charge density on the plate. Due to these forces,a tension develops in the thread. Let the surface charge density on the plate be σ.
σ2∈0It is given that in equilibrium, the thread makes an angle of 60° with the vertical. Consider the situation of the previous problem. (a) Find the tension in the string in equilibrium. (b) Suppose the ball is slightly pushed aside and released. Find the time period of the small oscillations. In equilibrium state, the thread makes an angle of 60o with the vertical. The tension in the thread is resolved into horizontal and vertical components. Two large conducting plates are placed parallel to each other with a separation of 2⋅00 cm between them. An electron starting from rest near one of the plates reaches the other plate in 2⋅00 microseconds. Find the surface charge density on the inner surfaces. Let the surface charge density at the conducting plates be σ. Let the acceleration of the electron be a.
σas shown in the figure (30-E6). Find the electric field (a) at the left of the plates (b) in between the plates and (c) at the right of the plates. σ2∈0(a) The strength of the electric field due to both the plates will be same but their directions will be opposite to each other on any point at the left of the two plates. σ2∈0-σ2∈0=0(b) Here the direction of the fields will be same. So, they will add up to give the resultant field in this region. σ2 ∈0+σ2 ∈0=σ∈0 (c) The strength of the electric field due to both the plates will be same but their directions will be opposite to each other at any point on the right of the two plates. Two conducting plates X and Y, each with a large surface area A (on one side), are placed parallel to each other, as shown in the figure (30-E7). Plate X is given a charge Q, whereas the other is kept neutral. Find (a) the surface charge density at the inner surface of plate X (b) the electric field at a point to the left of the plates (c) the electric field at a point in between the plates and (d) the electric field at a point to the right of the plates. Given that the charge present on the plate is Q. The other plate will get the same charge Q due to convection. Let the surface charge densities on both sides of the plate be σ1 and σ2. =Q2A ∈0This must be directed towards the left, as ‘X’ is the positively-charged plate. Three identical metal plates with large surface areas are kept parallel to each other as shown in the figure (30-E8). The leftmost plate is given a charge Q, the rightmost a charge −2Q and the middle one is kept neutral. Find the charge appearing on the outer surface of the rightmost plate. Consider the Gaussian surface as shown in the figure. Let the charge on the outer surface of the left-most plate be q. Thus, the charges on the plates are distributed as shown in the diagram. The net field at point P due to all the induced charges must be zero, as it is lying inside the metal surface. Let the surface area of the plates be A.